If you want to impress your friends and co-workers while being able to get more done while sitting at your computer, the new 30″ flat panel monitors really rock. Conclusion: If money is no object and you’re an early adopter, you really have no choice and must get your 30″ flat panel monitor before everyone else. For everyone else, waiting another year means it’ll probably come down half in price and video cards in computers will improve their support for massive-sized flat panels. Have you ever used the “Pros & Cons” Article Template before and do you have any tips to add?UPDATED March 26, 2007 7am CST: Updated all Pro’s and Con’s to become Pros & Cons. As usual you always come with the brightest ideas ! The only thing that I can add is how to get the cons and the pros. Unless you have your own experience with a service or a product, you can look at the tiles of the search results for a given term in the 2 or 3 first pages, then you will feel where the writer stands for, or you may find some one else is writing about the pros and cons. Loved the article. I, too, firmly feel that showing both sides of the fence adds to your crediblity that you’re being totally upfront and honest with your reader. I really like the “comparison” method between two or more products or services as well. Great idea for an article. Just make sure you don’t adopt this style if you’re writing letters to the editor of newspapers and magazines. Those letters require that you take a strong position. Also, there’s no apostrophe in “pro’s” and “con’s.” It should simply be “pros and cons.” The words are plural, not possessive. What about “Lube Pro’s” or “WebSite Pro’s”? I completely agree that there are times when you don’t want to show the CONS of an argument. That one is not in my first collection of 26 article writing templates nor yet in the second set of 26 I am developing – GREAT idea! Joan – nice to see you on the blog! This is great! My subject is so controversial that using your pro and con template will give me alot of fodder for my articles. I remember using this style for college essays but, have not used it for any articles that I have written. Another arrow for my bow! A really useful suggestion. I’m already putting some ideas together. Great idea, Chris. Reminds me of my school days in the Debating Society! Now that I think about this, the more genius it is to provide the cons about a product or situation. It’s all too easy to be thinking about the benefits and features of the product without regard to what my ideal customer really wants. Anything I can do to “get inside the customer’s head” and write to their heart, problems, confusion, objections, and pain, the more I will connect with them. And the more I can connect, the more interested they are going to be. I think that’s a really good thing to work toward. If I do nothing more than get my own thinking switched from “me” to “us” — I will have done us both a service. Thanks for the valuable lesson! This is quite interesting. I shall certainly give it a try. The format is an excellent way to remain objective in your articles, i.e. “keeping the emotion out of it.” (which is something you were talking about maybe a month or two ago?). As an editor, a pet peeve is the incorrect use of possessive: “It’s” instead of “its” and “pro’s and con’s” instead of “pros and cons. That sort of thing. In my mind, nothing can damage one’s credibility more than to confuse the possessive with a verb. That being said, this is definitely a great tip which we will be certain to use. Excellent topic and there should be articles like this for every possible industry here and every topic within those industries too. As a new writer I see this as a valuable tool to add to my series of articles by presenting a different approach to writing. Thanks, Chris, for the helpful information. Thanks for the info. I just finished writing an article using this technique. This is a very helpful information. It is something I am sometimes forgetting to think about while writing my articles. Well, one thing more I now can add to my collection of useful tips. The good thing (pro) about this template type is the fact that both sides get a voice in your article. The bad thing (con) about this template style is the fact that both sides get a voice in your article. However… All the voices in my head like it! as an ezinearticle.com starter I am still very busy to get basics right. Also, writing in English is hard for somebody like me whose mother language is different. However, I enjoy it very much to learn from your tips. Somehow, you also help me for my homepage writing. The pros and cons idea is great. Shouldn’t there always be the author’s standing as conclusion to the pros and cons? Or am I confused? I mean like in real life where one is pro and the other is contra and where the mediator comes up with the conclusion? That should be the role of the article author as well. Sure, yes. I would think most authors would argue their point as to which is better. Wow, that is great stuff. I am about to write another article and use the advantage vs. disadvantage technique that Dina at wordfeeder.com proposed. I think I will use the pros and cons for my next article instead. Thanks Chris. This is a great way to cinduct an article. Great tips one should keep in mind. However, imagine as a junior writer, putting bits and pieces together to create a great an article that is readable to your audience. I always miss the conjunctions, propositions etc, while I am searching for attractive phrases to submit with pros & cons. Great tips! As a consumer, I would certainly want to know the pros as well as the cons beforehand instead of discovering about the cons later on while using the product. Articles with pros and cons listed would be more appealing to readers. Thanks for a great tip. Liked “pro’s & con’s because it is about opening case and finding its facts whether they are postives and negatives and then closing the result with mostly an acceptable conclusions no matter what was process you have gone thru. Nice info on the article template i will see if i will implent it into my own article routine! I didn’t even think about using pros and cons in my review. It is perfect! It looks like I’ll have no problem finishing it up now. Very nice article on Pros and Cons as a means of attracting readers. Questions asked and answered is a great format for others to benefit from publishers experience. I would only add its important to stay unbiased otherwise your audience will see your trying to sell them and your integrity is lost. Thanks for introducing me to the pro – con article format. I will use this format on the next page I write. When i write interactive and resourceful article, then my readers share many comments then long and boring contents. Actually, this Pros and Cons article template enlight me to overcome from the traditional ways to modern way to write interactive article like this. 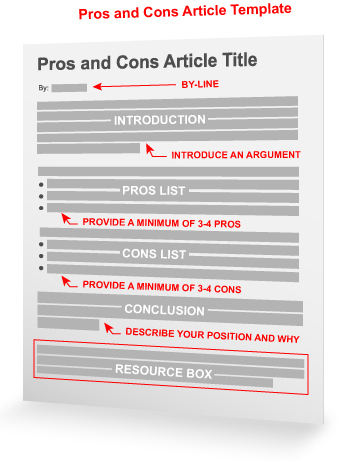 Its useful and very impressive post about The pros and cons article template. This format definitely will help us to write articles according to it. Although discussing one topic in a critical view is important and can always win readers, we authors may always forget this and just do our best to ignore benefits of something. Yes, readers love critical thinking rather than one-sided articles. Meaningful post!